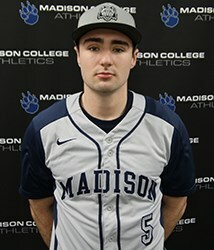 A sophomore outfielder on the Madison College baseball team, Nathan Aide is hitting .354 this season with 17 hits in 48 at-bats. He has three doubles, one triple and one home run so far this season. Last year, Aide was named second-team all-region after playing in 51 games and hitting .339 for the regional champs. Aide is a graduate of Franklin High School, where he was named first team all conference his senior year. He was also named first team all-suburban and second team all-state. A liberal arts transfer major at Madison College, he is the son of Rick and Shelly Aide. 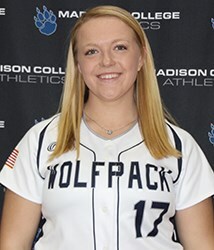 A freshman pitcher with the Madison College softball team, Jordan Martin leads the team with a 6-2 record. She has a 2.76 ERA, and has allowed 22 hits and 15 earned runs in 38 innings pitched. Martin has struck out 60 batters while only walking 17. She is agraduate of Hortonville High School, where she was named first team all-conference twice, first team all-district once and received WFSCA All State honors. The daughter of Nikki and Andy Martin, she is a student in Madison College’s agribusiness program.